This document presents a report on promoting economic empowerment of adolescent women and young girls. In October 2008, the World Bank launched the Adolescent Girls Initiative, a public-private partnership to promote the transition of adolescent girls from school to productive employment through innovative interventions that are tested, and then scaled-up or replicated if successful. The initiative is being piloted in 8 countries Afghanistan, Jordan, Lao PDR, Liberia, Haiti, Nepal, Rwanda, and South Sudan and is currently reaching some 17,000 girls. 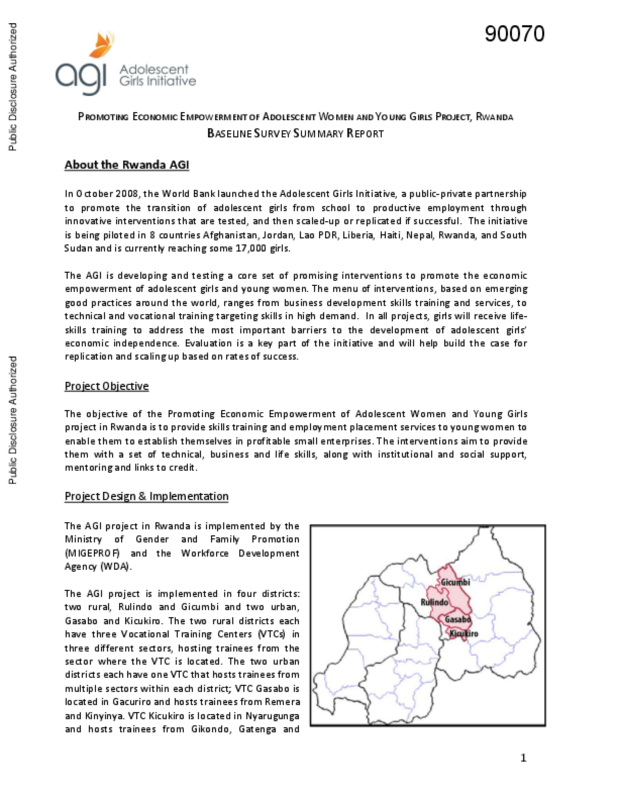 The objective of the Promoting Economic Empowerment of Adolescent Women and Young Girls project in Rwanda is to provide skills training and employment placement services to young women to enable them to establish themselves in profitable small enterprises. The interventions aim to provide them with a set of technical, business and life skills, along with institutional and social support, mentoring and links to credit. The Adolescent Girls Initiative (AGI) project participants are between 16 and 24 years old, out of school, and have some primary education. AGI respondents are a diverse group, representing different age groups, geographic locations, educational attainment and employment status. All ages between 15-24 years are equally represented with an equal split between respondents who are aged over 20 and under 20 years old. Educational attainment is also evenly distributed as approximately half of the population has primary education or below, while the other half has some secondary education or above. While over three-quarters of respondents are employed, they are involved in different types of activities such as household agriculture, wage employment, non-farm businesses and internships or apprenticeships. AGI respondents are not representative of the general population. This can be partially attributed to AGI program criteria; for example, while educational attainment is quite low among young Rwanda women, the AGI program requires that respondents have some primary education in order to participate. The AGI survey population appears to be more educated than young women in Rwanda overall. While a very low number of Rwandans live in urban areas (under 20%), approximately 40% of the AGI survey population is from urban districts. A large share of AGI trainees report having at least one Income Generating Activity (IGA). Many of the respondents report having more than one. Only 21% of respondents report having no IGA. To show results, the project will need to not only increase young women's employment (e.g. the number who report having an IGA), but will also need to improve the intensity of young women's employment and the earnings received from their IGAs. Respondents report expecting to be at a much higher position in life two years from now compared to where they are now and less than 1% feels that their lives will not change following the training. Respondents are particularly interested in opportunities to learn a new skill, learn how to run a business and hope to be healthier and have a better life following their participation in the AGI project.